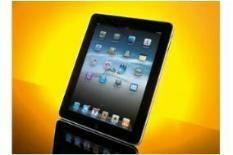 Apple iPad Wi-Fi review | What Hi-Fi? While ‘fanboys' and ‘haters' continue to bicker about the merits and flaws of Apple's iPad, one important question remains: what is it actually for? After all, here's a device that's essentially an iPod Touch that's too big to be considered a portable media player, yet is also too limited to completely replace the laptop. Apple would argue that's exactly the point: the iPad won't replace either, but exist in a new market segment. Now we've seen it, we're inclined to agree: what matters isn't what the iPad doesn't do, but rather what it does do. For a start, it's an eReader. Apple's impressive-looking iBooks store is yet to launch in the UK, but Amazon's Kindle app is fully compatible, and proves that reading a novel on the iPad is a delight. Brightness and font size can be quickly adjusted to avoid tiring eyes, and flicking pages feels surprisingly natural and realistic. iPad versions of magazines and newspapers work even better. The vibrant screen successfully recreates the glossiness of Popular Science, and because you only need to see a small part of a column at any one time, text doesn't completely obscure the photos. Surfing the web is so simple on the big screen, with the tablet benefiting from the upgrade to 802.11n wi-fi. Accessing pages is quicker than on the Touch, and they're more readable. The larger surface makes the flick-and-pinch gestures even more intuitive, and the virtual keyboard is spot on – we're sure many will touch-type documents using the word processor apps. It's arguably the apps that have helped the Touch and the iPhone become so successful, and no doubt the iPad will fair similarly. There are already iPad-specific apps appearing, from the hugely impressive Marvel comics reader, to the aforementioned word processors, and there will be more, including plenty of HD games. Talking of HD, the 1024 x 768 screen makes downloads look superb. Play an HD episode of Lost and the crisp detail, black depth and bright colours are an absolute joy, while the sound from the built-in speakers is surprisingly reasonable, even if it's a bit quiet. You'll want to use headphones for serious listening, and if you do so, you'll be rewarded with a musical presentation that adds extra weight and attack to the already detailed and rhythmic delivery of the Touch. There are little niggles, like no built-in clock or calculator (though you can download third-party apps) and it still lacks Flash support, meaning many web videos don't appear. If you want to view iPlayer, only the low-res iPhone version currently works, although we expect that to be improved soon. Also, Apple claims the screen has a fingerprint-resistant oleophobic coating, but ours became grubby very quickly. If you take those grumbles on board, and understand the iPad's not a portable media player or laptop, but designed as a luxury item that fits between the two, it's easy to love and fully justifies the £429 price tag.